So Degò restaurant and wine bar can be found at 4 Great Portland Street …or more accurately, it’s rather difficult to find at 4 Great Portland Street. Locate that corner plot and walk the few yards down Market Place and you will find Degò (the accent is on the ‘o’). A quiet side street that might just be deserving of a few more visitors in future. The name Degò comes from the Italian words “Degustazione” (tasting) and “Osteria” (tavern). 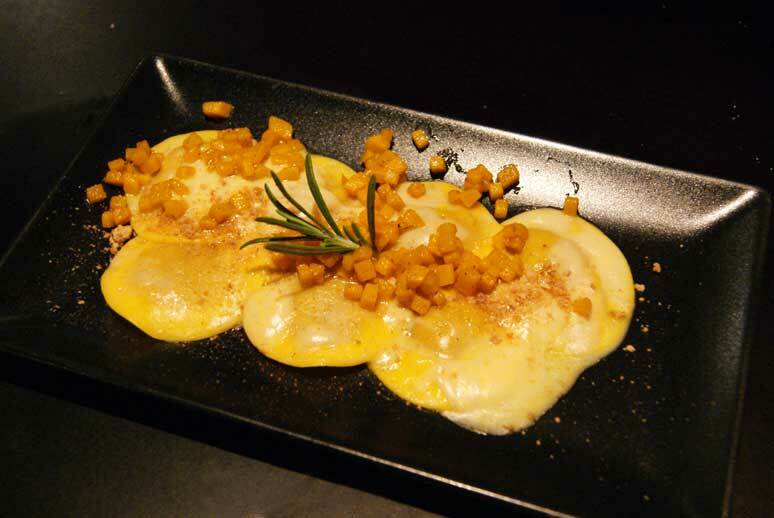 These osterias became popular during the 1950s as good places to find traditional food. This contemporary and high-end counterpart has both food and wine as equal and complementary partners. Degò was opened on 16th October and is enjoying increasing popularity with both Londoners and transplanted Italians (half the guests were Italians on the evening we visited). It isn’t a restaurant of the more common southern ilk with its pizza and ready use of Mediterranean ingredients. This is the food of Veneto. Where exactly is Veneto? It’s the region of Northern Italy surrounding Venice. That brings to mind plastic gondolas and cheap souvenirs from holidays several decades past. Those little black boats with their static and lifeless oarsmen graced the top of many a black and white TV. One might fear that a restaurant representing that city could feature such outdated tchotchke (a word denoting dust-collecting ornamentation much favoured by grandmothers.) Think Italian chic restaurant, striking use of colour and some stunning red glass ceiling lamps that one is, romantically, driven to believe might have been fabricated in those celebrated Venetian glass workshops of Murano. 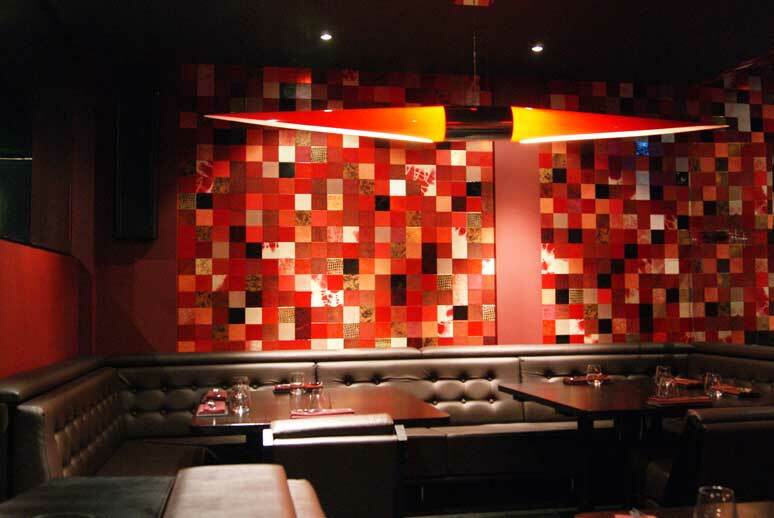 The walls of the downstairs restaurant are decorated with vibrant tiles in reds, black and white with accents of gold. The seating is versatile, offering low-backed leather-upholstered banquettes which can be configured to accommodate couples or parties. The black wood tables are artfully designed to house a sunken ice-bucket. Another indication that wine is taken seriously at Degò. Massimo Mioli comes from a family of restaurateurs. 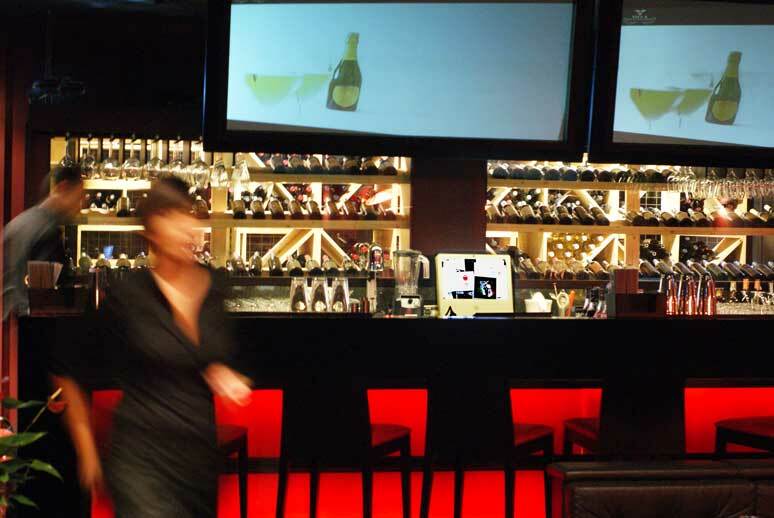 Together with three childhood friends, he came to London to open Degò. Head chef is Dario Schiavo, who has already worked with Alain Ducasse. The ages of the group range from late teens to early thirties. Their youthful enthusiasm is matched by their knowledge and professionalism. We started our culinary Veneto adventure with a taster of Ravioli di zucca, taleggio e amaretti – homemade ravioli filled with pumpkin served with taleggio cheese and amaretti biscuits. This unlikely melange of ingredients was indeed a marriage made in heaven. The delicate pasta parcels were topped with tangy cheese which was contrasted by the sweet and almondy crumbled cookies. 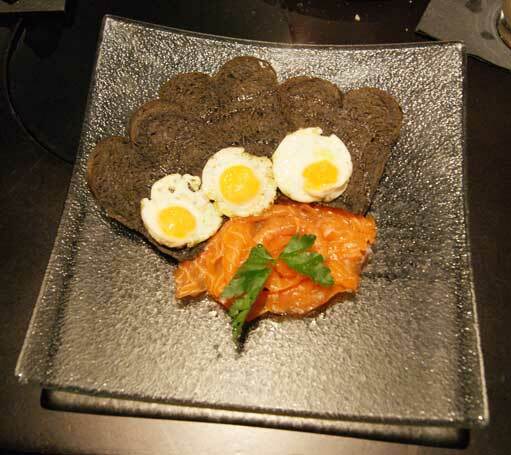 Uova di quaglia all’occhio di bue con pane nero e carpaccio di salmone – fried quail eggs with black bread and salmon carpaccio – offered a tapestry of colour, texture and taste. Once again the constituent parts of this simple dish contrived to present a hearty and comforting plateful. Insalata di polipo e patate condita con olive nere e ribes – octopus and potato salad with black olives seasoned with redcurrant sauce – was another intriguing proposition. The octopus will be enjoyed by any aficionado of these cephalopod molluscs in the order Octopoda. The flesh was tender and the diced potato made this a substantial starter. I had my doubts about the fruit sauce but it honesty did add to the experience. My guest was curious about the Suprema di pollo in crosta di sale vanigliato con tarassaco in padella – chicken supreme in a salted vanilla crust with taraxacum – which offered both flavour and theatre. The chicken is encased in the cement-like crust and de-salted by the waiter by way of deft cracks and cuts. The chicken was moist, tender and well seasoned. Filetto di maialino da latte e pancetta con misticanza di verdure al cartoccio e ristretto di Barolo – suckling pig fillet with bacon served with steamed mixed vegetables and Barolo sauce – must surely be the Degò signature dish. The meat is delicate and flavourful with a wrap of bacon for added savour. Still more theatrics as the dish is presented en papillote. 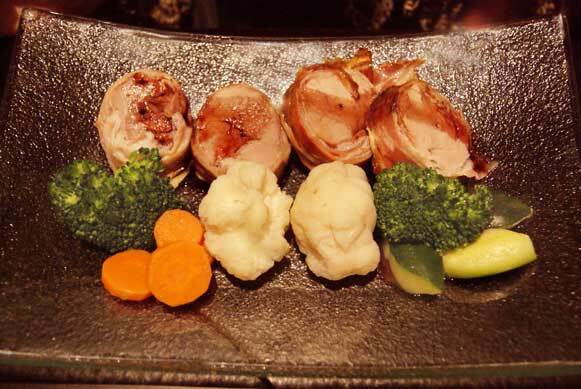 The clear cellophane is domed with the steaming pork and vegetables, which are served hot from the bag, the plain vegetables making a perfect foil for the richness of the meat. The Barolo sauce was almost a jam of reduced red wine. A well-chosen delicious accompaniment and rather stylish. I am sure there is a law prohibiting guests from leaving Italian restaurants of any regional persuasion without trying a dessert. Gelato di castagne, tortino al cioccolato e salsa al brulé – chestnut ice-cream, chocolate tart and brulé sauce – was my seasonal choice. 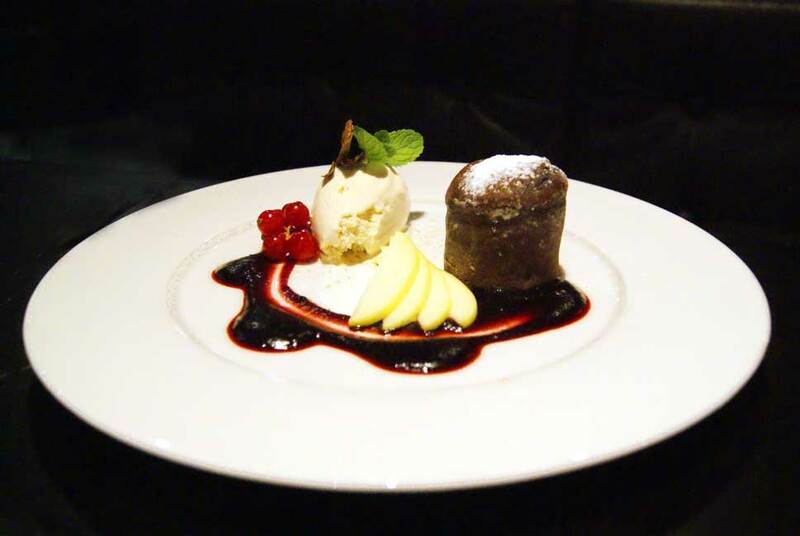 The chocolate tart was more of a chocolate fondant cake and a fine example of the genre. The chestnut ice cream was a revelation and has given me an idea for dessert for Christmas dinner at home. The brulé sauce was not the burnt sugar confection that I had expected but turned out to be a mulled wine sauce which was moreish and festive. Crostatina di datteri, gianduia e salsa al mandarino – date tart with hazelnut chocolate and tangerine sauce – was my guest’s choice of dolce. He proclaimed the fruit paste on a sweet biscuit base to be good enough to encourage a second visit. The tangerine sauce had that citrus flavour that reminds one of childhood yuletides. Degò is an eatery that is acquiring a good reputation with Italians in London as well as those who want to try a cuisine a little different from the usual high-street Italian restaurant. Nothing wrong with those, but Degò concerns itself with the specifics of Veneto and wines to enhance those unique dishes. Well worth a visit.